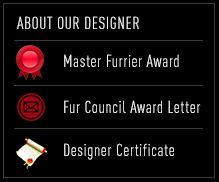 Designers Guy Laroche | Glama Furs, Inc. North Shore's Finest & Largest Furrier, Since 1974. Our mission at Glama Furs is to offer the best quality in designer furs. We carry furs from designers such as Guy Laroche, Zuki and our own brand Glama Couture. To view our entire collection of designers please stop by our showroom today. GLAMA FURS, Inc., North Shore's Largest & Finest Furrier Since 1974. Glama Furs is located in Peabody, Ma. We specialize in fur coat sales, storage, cleaning, repairs, re-styling & monograms. We carry mink, fox, beaver, raccoon, chinchilla, coyote and more. We also carry fur accessories like handbags, vests, hats, scarves & more.